Site name and description: City of Seattle. Web site dedicated to provide information about Seattle to citizens and tourists. While there is no ”About” page, it’s clear the information is about the City of Seattle. It covers a broad range of information from finding a job to paying a utility bill, 911 incident responses, pothole repair, etc. The site brings a lot of information together in one place and serves as a hub for all-up city government information for several different audiences. 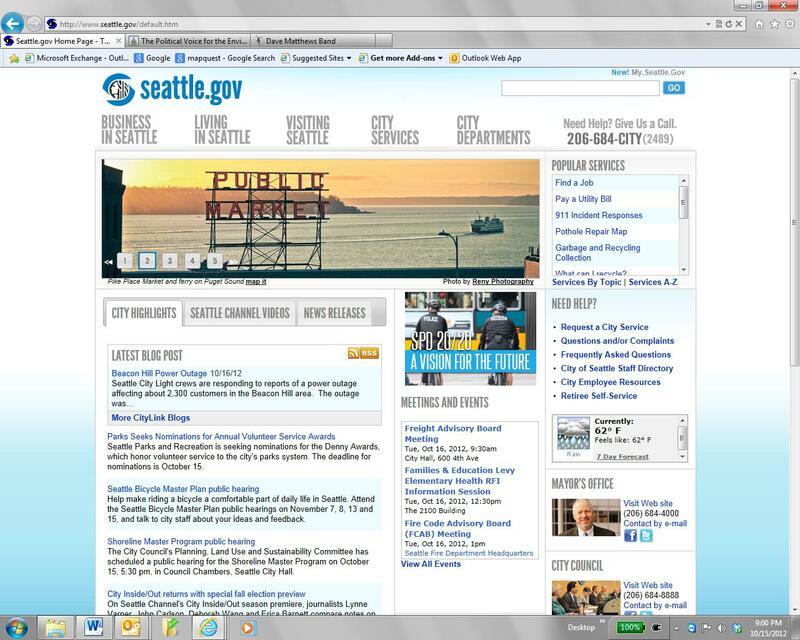 Design overview: The site has rotating scenic shots of Seattle above the fold. The city’s blog is front and center, keeping people up to date on what’s going on. It includes Seattle videos and news releases – things of interest. Five categories help a visitor to select which area of interest best meets their needs. The five areas are Business in Seattle, Living in Seattle, Visiting Seattle, City Services and City Departments. There are two primary ways to access city government information, via services and departments. Audience: Broad, for citizens, tourists and businesses. Social media integration: Tons of social media integration including its own “Seattle Channel” on Cable Channel 21 featuring its own programming/“feature shows” and daily shorts. Have link to social media sites, but need to dig; buried on bottom of page. The site has a clear, clean, simple design that works well for such an information-heavy site. The City has worked to make it easy to find information, with a list near the top of each page of frequently-searched items and pages organized by what users are likely to be looking for. The structure seems to reflect audience research. Technology allows the user to create a customized portal (see above). Some limited information is available in 30 different languages, although the links to translated content are not easy to find.